I am so happy to be part of the Festive Fall Home Tour, sharing how I incorporate seasonal elements of nature into my home decor. 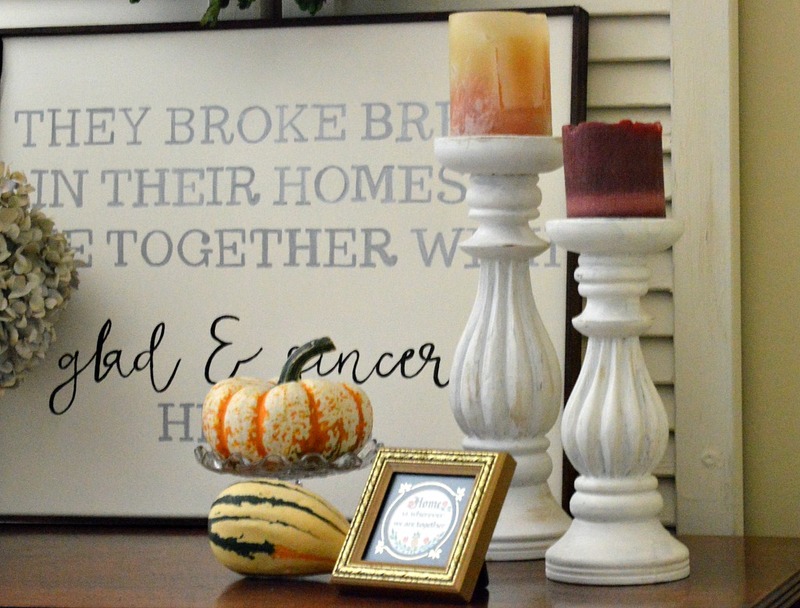 I am so happy to be part of the Festive Fall Home Tour with a wonderful group of talented bloggers. Fall officially begins this week and it is slowly making its way into my home. Autumn blooms, textured blankets, and unique gourds are beginning to appear. 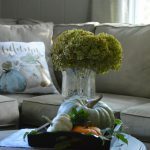 I am happy to share some of the touches of the season that have started to pop up in my home. 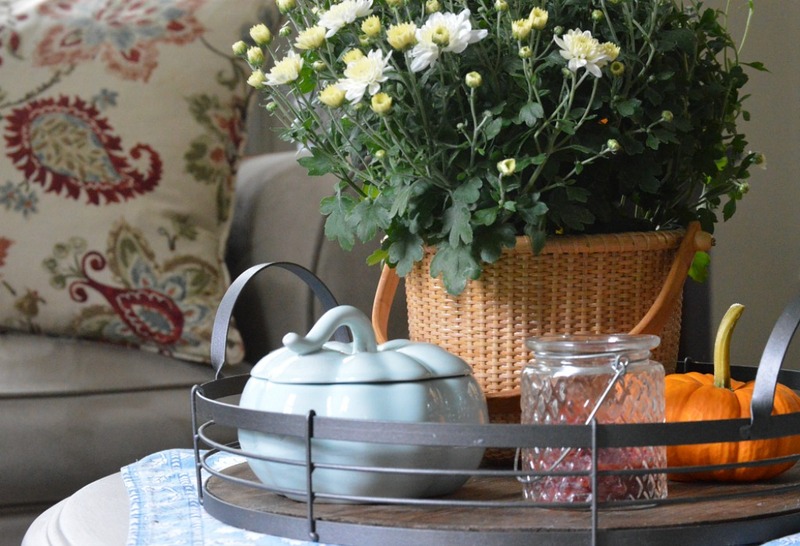 Starting in the family room, a mini pumpkin garland adds a subtle touch of fall to our mantel. 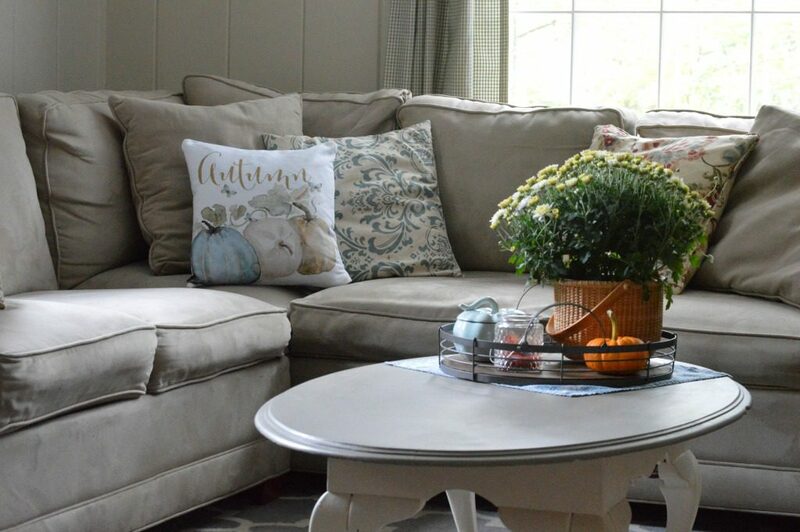 Pillow covers are such an easy and inexpensive way to change up decor. Last year I had purchased a couple of pillow covers from Craftberry Bush. Lucy from Craftberry Bush is such a talented artist and I enjoy having a little bit of her beautiful artwork in my home. A variety of textures, colors, elements of natures, and varying heights are found on this coffee table vignette. 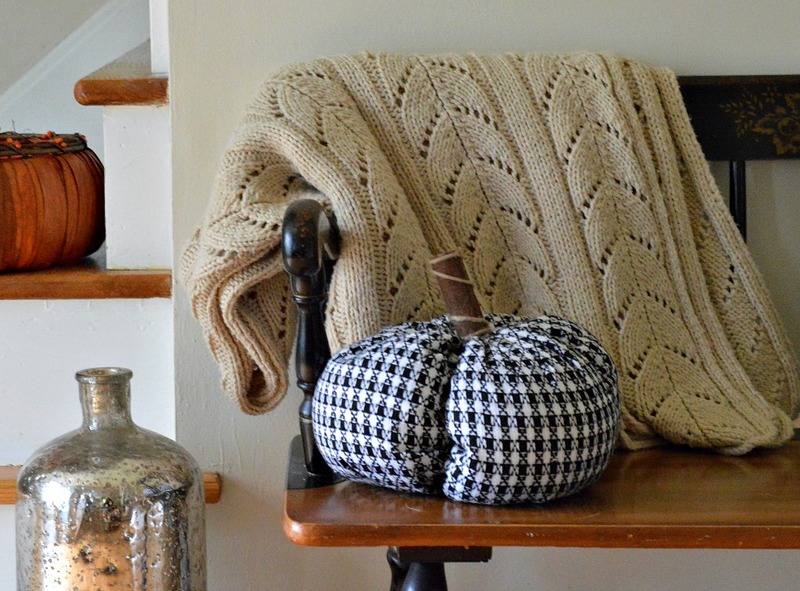 The texture of this homemade afghan, along with a houndstooth print pumpkin from Home Goods, and a pumpkin basket add a little bit of fall to our hallway. This deacon’s bench belonged to my grandparents. I love filling my home with meaningful pieces. 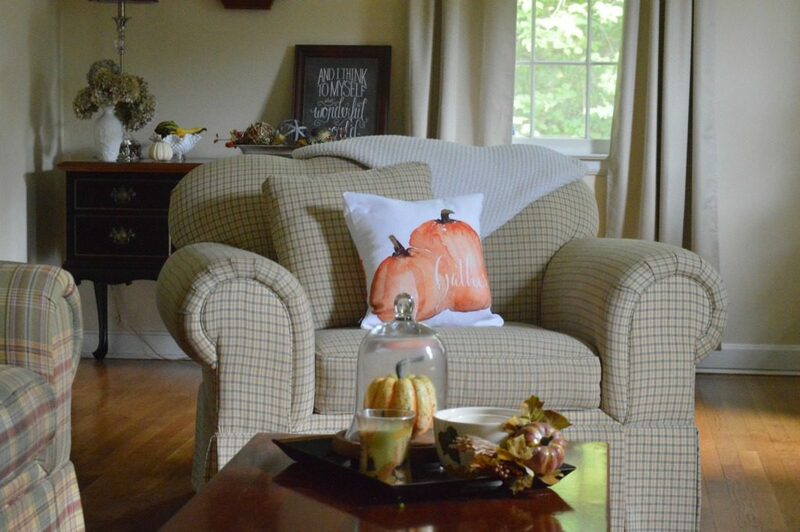 Another pillow cover and some natural elements add a bit of seasonal color in the living room. Milkglass and hydrangeas…a couple of my favorites. Pinecones and a few seasonal stems add a touch of autumn to this tray of spheres. It sits in front of one of my favorite Dear Lillie chalkboard prints. My dining room has only a few touches of autumn. Right now it is the place where I am assembling some goodies to send to my college boy. Doesn’t everyone love to receive a care package? In front of my DIY Sign That Almost Wasn’t sit more elements of nature. I love the unique details. It all sits in front of my Re-purposed Shutters Wall Art from last summer. These shutters are still one of my favorite projects! 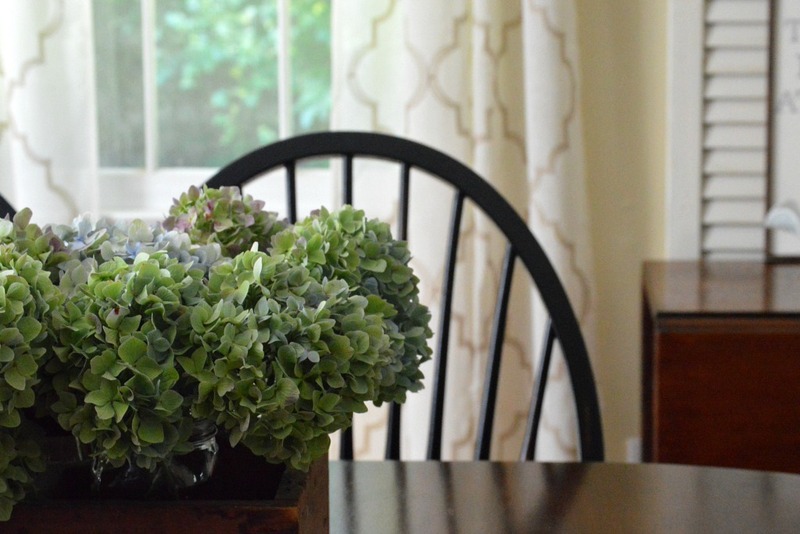 The soft, muted colors of the hydrangeas drying on the dining room table make me smile. 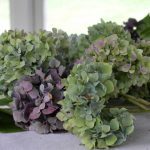 I recently shared how to dry hydrangeas. 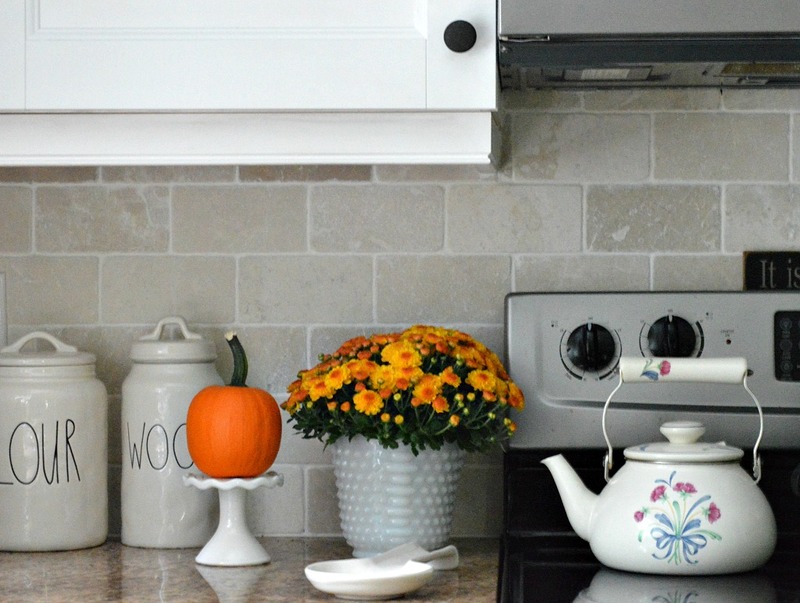 Natural shades of fall can also be found in the kitchen. 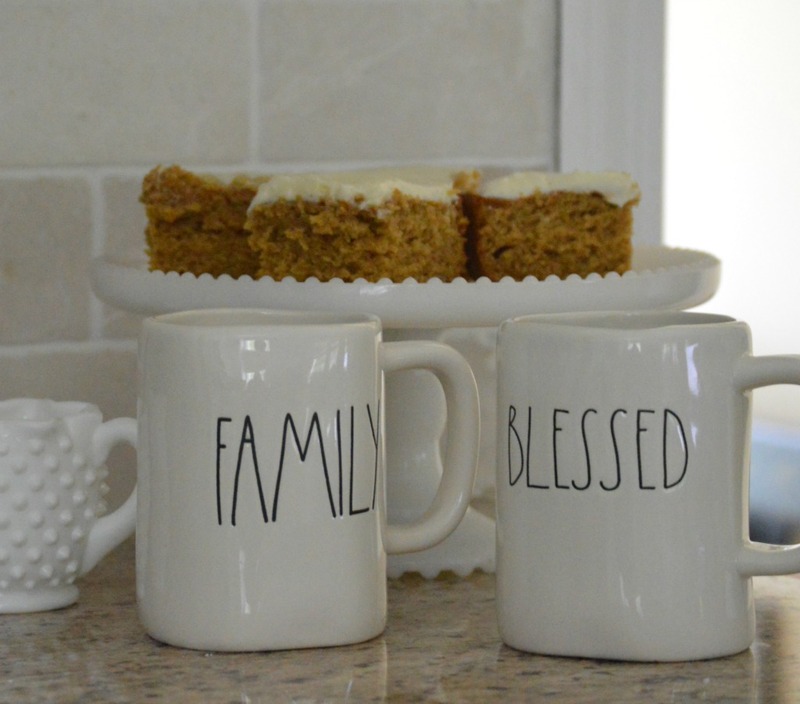 These pumpkin bars with cream cheese frosting are one of my family’s favorite seasonal treats. Don’t miss my recipe for Perfect Pumpkin Bars! 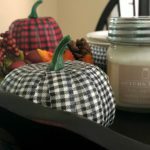 Along with all of the colors and textures, I like to bring the scent of fall into my home with this easy DIY simmerpot recipe. Thank you so much for stopping by! If this is your first time visiting, I hope you will subscribe and visit again soon. Please visit my friend to see what they are sharing this fall. 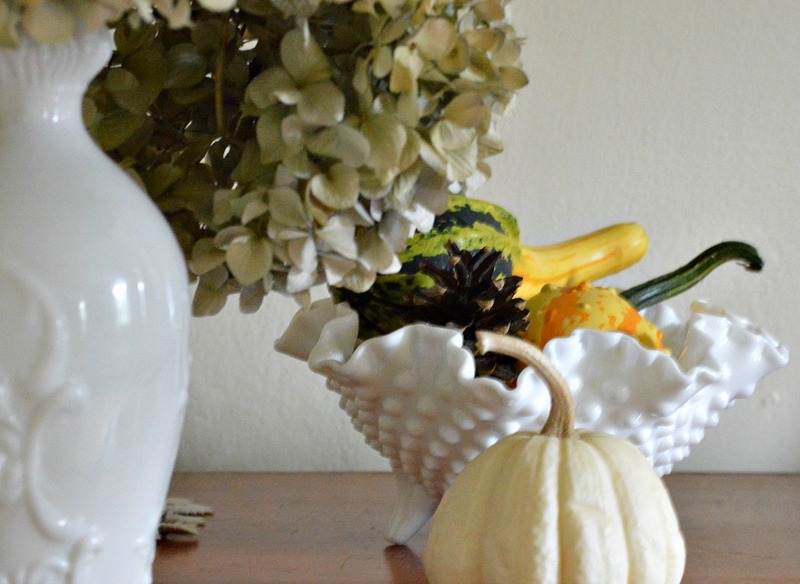 Love all the beautiful touches of fall around your home! 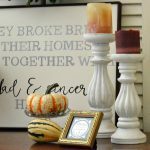 I so miss having a HomevGoods store near me! Your home is not only pretty but the scents must be amazing. I adore the ‘They broke bread” artwork. 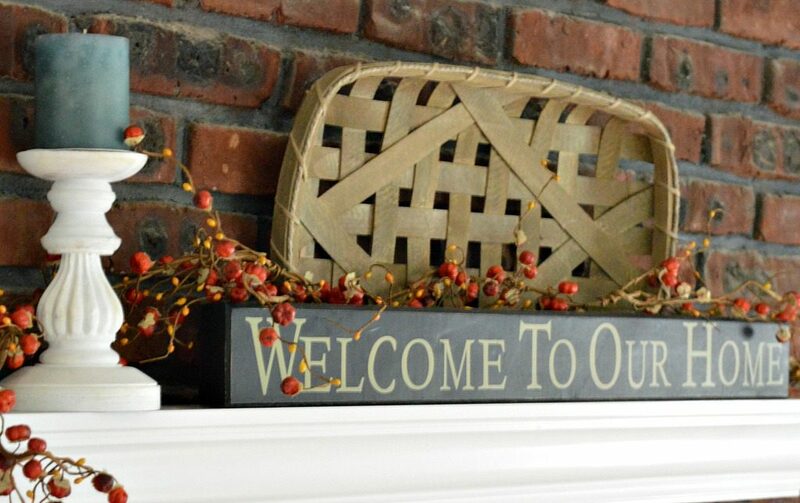 I am trying to make a few of these types of signs in my home. Yours is gorgeous and I love the verse. The milk glass is also elegantly beautiful as well. I adore your Farmhouse Fall Decor, Lynne! Fabulous job decorating for Fall. 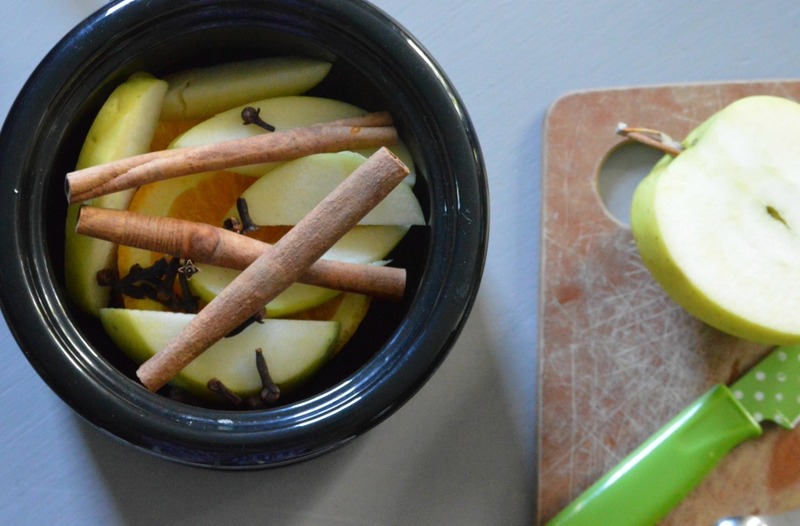 I bet that simmering potpourri has your home smelling delicious. It made me wish my screen was a scratch & sniff! 🙂 And I’m exciting to read all about your chalkboard sign and refurbished shutters because I’ve been wanting to do something similar in my home too. You have a lovely collection of milk glass and your hydrangeas are beautiful. Your home looks so comforting and warm. Your family and friends must feel very welcome there. Lynne, I love the blues! I think the whole group had a touch of that this year. It just adds more dimension to the color palette. 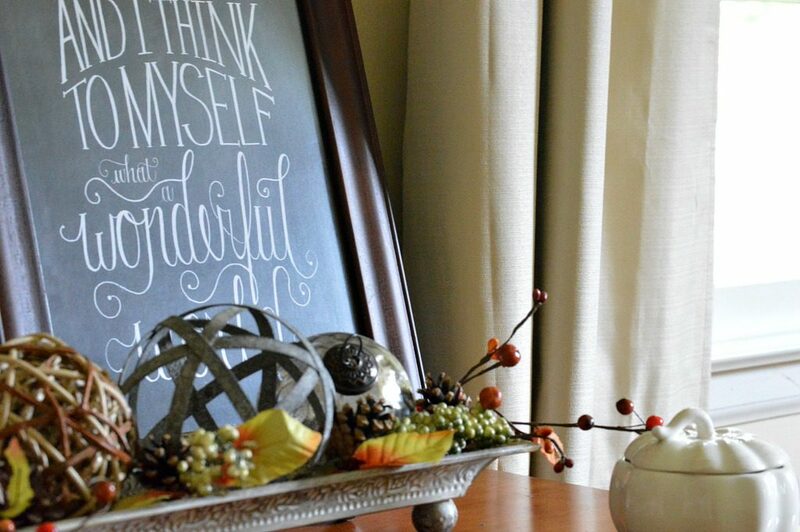 Your chalkboard photo at the beginning was really beautiful, not only the saying but the display and photo itself. Thank you for sharing your home for FALL! 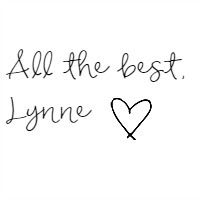 Lynne – I always feel like your home has that welcoming, sit down and be comfortable feeling. Every thing looks so well thought, yet so natural and unpretentious. I love that you have a bench from your grandparents; incorporating things, especially pieces of furniture from our loved ones, helps keep them in our hearts and minds. I am always delighted to be part of a blog hop with you!